It’s hard to work up the courage to dash to the gym when stepping outside immediately freezes the part of your ankles not protected by your leggings (#RealLife). But despite the continually below-freezing temps, you still deserve a winter filled with all your go-to wellness rituals. The solve? Transforming your home into a wellness oasis (yes, it’s possible). 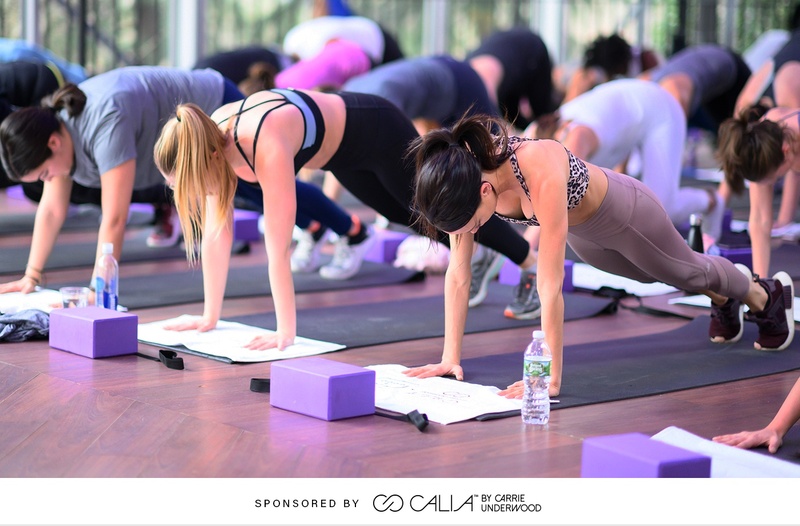 To show you how to do it, we recently took our own advice and teamed up with CALIA by Carrie Underwood for a winter wellness event at Tavern on the Green in NYC. More than 75 Well+Good readers gathered in the luxe (warm) indoor space to celebrate the new year, work out with Le Sweat founder Charlee Atkins, and chill out (figuratively, not literally) with other feel-good wellness activities. Here’s a cool secret: You can totally recreate this day from the comfort and heat of your own home—all it takes is some light decor, the right wardrobe, and you just being you—until spring decides to grace us with its presence and you can rejoin the outside world. Keep scrolling for a peak into our wellness wonderland in Central Park—and see how to create a DIY wellness space at home. Can you feel Zen without the proper get-up? Nope. That’s why everyone who stopped by had their choice of Energize or Essential leggings from CALIA by Carrie Underwood, as well as a mat, block, and towel. So, before you begin your workout, meditation regimen, or even a nap (those are important too!) throw on an outfit that will match your mood—all while supporting your activity of choice and looking trendy, too. Natural light flooded in through the back of Tavern on the Green (where the mats were set up)—which made for the best type of morning workout. Take this cue and find the brightest corner in your apartment where you can (hopefully) spot a couple trees and see the sun. If not, hang orb lights to mimic a natural feel, and of course grab a cute yoga mat to match the vibe. Atkins (outfitted in performance-ready CALIA by Carrie Underwood Energize leggings and Move top) led a 45-minute workout sesh, and guests were le sweating all over the place. To bring her inspirational vibes home, follow Atkins on the ‘gram, where she posts tons of no-equipment-required workouts. Don’t you find it easier to get your sweat on when you’re in a color-coordinated environment surrounded by people with the same goal? It worked for motivating Wellness Wonderland attendees, which supports the case for inviting your besties to join you on your stay-inside-at-all-costs wellness journey (bonus points if you wear matching CALIA by Carrie Underwood leggings). After Le Sweat, Atkins changed into her Essential leggings and Muscle tank (which are ideal for lower-intensity workouts), and led the group in a 45-minute Le Stretch session to reflect and restore sore muscles. The best part about stretching at home? You can spend as much time in savasana as you want. Atkins gave everyone a moment to reflect on what their bodies just accomplished—so don’t forget to pat yourself on the back after completing your at-home sweat sesh. Good vibes are key. Once everyone was in a blissed-out mindset (thanks, post-workout endorphins), guests set intentions for the year. When setting your intentions at home, they can be as big or small as you’d like (like cooking at home more often or even finding 10 minutes a day to be still). Just be sure to make them authentic to you. The key to setting a mood while reaping health benefits? Essential oils, duh. But this time, grab all your fave scents and create a super-hybrid, personalized one. Did you just become a scientist? Got a mantra for 2019? Set one (and put it on a t-shirt) for your best year yet. All guests left with two wellness sage wands made with their preferred stone and some lavender. To DIY one at home, grab whichever herbs suit your apartment and a crystal to match, then wrap it all up with some sage. Before you know it, you’ll be that much closer to a living-room-turned-paradise situation.